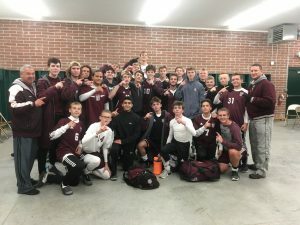 Congratulations to Head Coach Eric Simone and the boys varsity soccer team on an exciting finish to capture the Sectional Championship by defeating Canton GlenOak by a score of 2-1. The 6th seeded Spartans and 3rd seeded GlenOak played under adverse weather conditions in the first half and went into the locker rooms tied at 0-0. GlenOak scored first with 29 minutes remaining in the second half. But with 15 minutes to go, Tommy Fryda scored with an assist from Brian Yauger to tie the game at 1-1. Senior Captain Trevor Boggess then converted on a penalty kick with 9 minutes remaining in the game to put the Spartans up for good. Goalie Egan Hare had 5 saves for the Spartan. The Spartans will now advance to the Northeast District Semi-finals facing the #2 seeded Massillon Jackson Polar Bears. The game will be played on Wednesday, October 24 at 7:00 p.m. at the Jackson High School soccer and track complex. The Spartans are now 12-3-3 on the season. Let’s get out and support our Spartan soccer team.